NEW fixation saddle bag JENNY!!!! 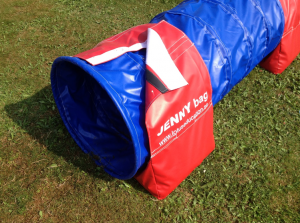 Here are photos of oficial agility tunnels for World Championship in agility 2012 in Liberec! We are also producer of tunnels for dog rescue test. Tunnels are made according to FCI and IRO rules. For more information, please, contact us on: info@tunelypropsy.cz. We have became sales representatives of Finnish agility obstacles producer Agimet for the Czech Republic and Slovakia! Very popular are their obstacles for training, especially slalom and zone obstacle. More information in section Obstacles. It is a very solid and storable obstacle in the shape of the sleeve. Tunnels are produced on diameter of 60cm and the length from 3m to 6m (on customer's need we can produce different diameter and length). They are made of very durable PVC (620 g/m2) and they are reinforced by special spring steel wires, which are covered the whole length to avoid possibility of injury during training or handling. Tunnels have a smooth inner seam. They can be used even in bad weather. Tunnels can be shaped into various arcs or curves. We deliver tunnels according to customer needs in various color combinations of the tunnel and stripes – white, yellow, orange, red, blue, green and black. Become our fan on Facebook and get an overview of agility competitions, photos and current special offers.